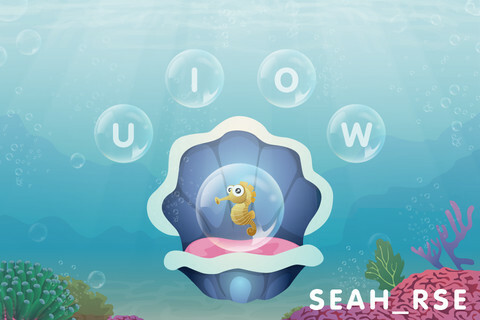 A new, under-the-sea themed alphabet application is now available on iTunes! ABC Day not only has an ocean theme, it also focuses on the alphabet in four different ways! Children can interact with the application by popping bubbles, repeating the letters after the app, and singing along with the ABC song. 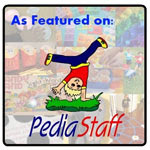 To learn more about this alphabet application, continue reading. 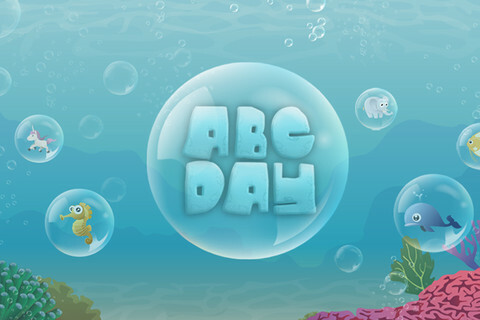 The Main Page will state "ABC Day" once loaded. Pop the bubble and the narrator will state, "Let's learn the alphabet!" Then, five bubbles will appear - a book, a feather, a shell, a musical note, and an "!". Pressing the exclamation point brings users to a page that shows the credits, social media sites, and contact information. Press on the book and "let's read along" will be stated by the narrator. The app will then move through the alphabet on its own, showing each letter. The letters will appear in upper and lower case along with a word starting with that letter and its image. To move faster between letters, pop the letter bubble. To choose a letter, press the "A-Z" button, then choose a letter of the alphabet to view what is associated with it. Pressing on the feather button brings the user to the handwriting portion of the app. The child is to drag his or her finger along the path of stars to have the turtle follow to write each letter in upper and lower case. As the turtle follows the users' finger path, a white trail will appear. If the user goes outside of a line or goes the wrong way, a funny sound will play. When you enter this portion of the application, it starts from where you were last time. You can press "A-Z" to choose a letter. When you write the letter in uppercase, it will state the letter name of the letter. If written in lowercase, the letter's sound will be stated. The shell will be closed and the narrator will state, "tickle the shell to play with your friends." Then, once you press the shell, four letters will appear in bubbles to fill in a blank of a word at the bottom of the app. The image (animal) associated is shown in a bubble inside of the shell. If a letter is incorrectly chosen, a sound will play. If it is correct, the letter will appear in the blank of the word and the app will state a compliment. Then, one can "tickle" the shell again for a new word. 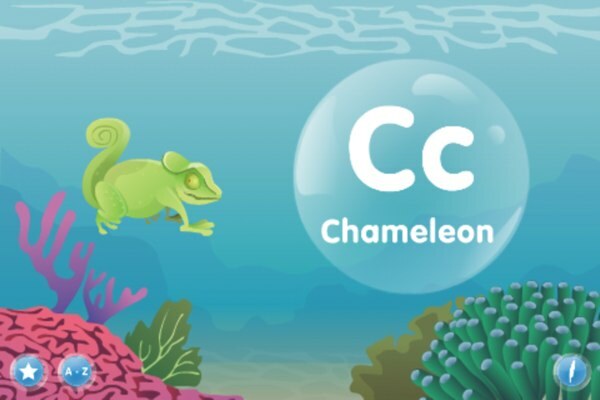 The ABC song will play/be sung and the user can pop the ABC bubbles to view animals that start with the letter while it plays. I like how there are four different ways to learn the alphabet. It is great that the application practices upper and lowercase letters as well as letter names and letter sounds. Users can press "A-Z" to view a specific letter at any time. Letters are associated with words that begin with the different letters of the alphabet. 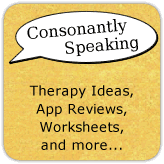 I would like the application to state the associated word for each letter for children who have difficulty reading and are learning vocabulary. In regards to the shell portion of the application where the child has to spell a word, with the blank space being in random spots of the word, this makes it tricky for pre-reading children to determine which letter is missing. It would be more appropriate for children to determine the beginning letter of the word. The bubbles in the ABC song portion of the application move a bit too fast at times to press along with the song. Articulation - Choose the letters associated with the sounds in which the child is working on and state the word associated with it. You can also have children state as many words as they can think of that begin with their sound or have them use the words on the page in their own sentences. Auditory Bombardment - Play the application to have the child hear the alphabet song and letter sounds. Expressive Language/Writing - Have children state/write sentences using the words associated with each letter. Receptive Language - Children can identify letters as well as different animal vocabulary through this application. ABC Day is available for the iPod Touch and iPhone for $1.99. It can be maximized to use on the iPad as well.